The Most Important Chart in Economics? Earlier this month, the U.S. Federal Reserve quietly released the Financial Accounts of the United States. Like most government data, the 198-page report (known to insiders as the Z1) is almost impossible to understand. However, to the economists and accountants who wade their way through the mess, the implications are clear. America has been growing government, business and household debts faster than its economy for more than four decades. Despite the huge runup in asset prices during that time, the country is essentially bankrupt. The impending disaster becomes even clearer when presented visually. The above chart, compiled on the St-Louis Fed’s FRED site, strongly suggests that economists have been pushing a GDP expansion that has been fueled almost uniquely by debt. The story of how the American government and the Federal Reserve—with the quiet backing of university academics—fueled this elaborate Ponzi scheme unfolded in three stages. The first signs emerged in the 1960s and early 1970s, when American companies, after an almost three-decade free ride, began to get competition in international markets from countries such as Japan and Germany, which had been bombed back to the stone ages during World War II. By that time, the American public had gotten used to constantly-rising living standards. For politicians, asking voters to work harder or to curtail constant demands for “more” became increasingly more difficult. Governments responded with what became known as “tax and spend” economic policies. Taxing the hard-earned savings of workers and passing the cash to bureaucrats to spend instantly created “sugar highs,” due to the short-term effects of dumping extra cash into the economy. (Think of a hot-dog stand owner who can choose between opening up a second location or spending the cash on a family cruise. One choice generates immediate fun. The other creates jobs and long-term economic value). Those policies, which transferred massive shares of GDP away from prudent stewards who would have either invested it or lent it for productive causes, caused almost irreparable harm to the economy. By the mid 1970s, U.S. taxpayers—now taxed to the hilt—started to catch onto the scam and punish the politicians involved. Resolutions such as California’s Proposition 13 (which put caps on local property taxes) and the election of the anti-tax Reagan Administration in 1980 convinced politicians to change their tack. The Reagan Administration introduced a new innovation: it financed further spending increases (notably a large scale military build-up) by borrowing the extra cash. Like all politicians, Reagan and his vice-president, the first George Bush, loved “borrow and spend” economics because they got credit for announcing programs that taxpayers would only pay for long after they retired. By the mid-1990s, the public—egged on by maverick politicians such as Ross Perot—again began to figure out what was going on. The Clinton Administration thus started to take a new tack, by continuing to borrow and spend, but keeping key increases in new debt (related to unfunded liabilities for social security and Medicare) off the books. By the early 2000s, the U.S. government, led by Federal Reserve Chairman Alan Greenspan, moved in a big way to a “print and spend” economic model, which, as the slogan suggests, consists of financing new borrowing and spending by expanding the money supply. This, too, is a complex and opaque process, which few (possibly as little as one in a thousand Americans) fully understand. Since the 2008 financial crisis, the economy has been at a turning point, because the transmission method for Federal Reserve policy has been so overused that it no longer works. The chart comparing growth in total system debt and GDP is a crucial tool, because you need to look at America’s entire financial system over a long period of time to fully grasp how much of a mess the country is in. That’s because in the past, if one sector of the economy was weak—government, businesses or households—it could always draw on the other two for support. For example, if governments needed money, they could raise taxes. If businesses were strapped, they could jack up prices or governments could provide tax relief. If households were in trouble, central banks could lower interest rates to ease their debt burdens. But if governments, businesses and households are all strapped at the same time, there is no one left to bail the system out. The problem can be clearly seen in the two increasingly diverging lines on the FRED chart, which demonstrate that increasing amounts of new debt are generating increasingly less growth. Soon, that process will reverse; new debts will start to depress GDP growth. Interestingly, America’s Ponzi economics remain hard for even seasoned economists to wrap their minds around. The first is that most top policy experts, such as the Americans for Tax Reform, the Federal Reserve or bond rating agencies, focus their analysis on either government, household or business debts. Almost no one—with the possible exception of the Bank for International Settlements, along with Real Vision cofounder Grant Williams and one or two others—assesses the effects of all of these debts together. Secondly, many economists, most of whom are highly intelligent people and experts within their narrow discipline, simply don’t feel comfortable publicly discussing stuff that falls beyond their expertise. Indeed, most of their employers forbid this outright. Personal interests also play a role. Governments and university economists (who get much more government funding when they produce research papers that conclude the government needs to grow) are doing quite well in the current system. Banks, too, have no reason to say anything, as they have been bailed out by taxpayers several times during the past three decades while paying managers billions in bonuses. This is important, because bank economists have the clearest grasp of the dangers the financial system is under, and many speak quite openly about this—in private. This is where gold comes into the picture. 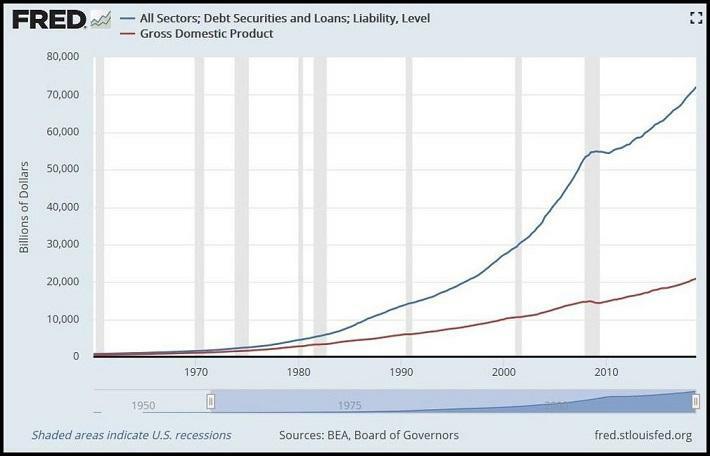 The Ponzi Chart graphically illustrates that U.S. system debt began to grow faster than GDP precisely in the early 1970s, when the Nixon Administration stopped backing the U.S. dollar with gold. The end game is also quite clear. The key question now relates to whether politicians can generate another “sugar high” cycle that could extend the Ponzi another few years, possibly even more. If so, how? MMT, which sounds technical, essentially means that governments print money directly instead of operating through traditional transmission methods, and distribute it to select interest groups. Possible steps could include implementing Universal Basic Income, lending money directly to favored businesses, or driving stock prices up by buying company shares on the open market. Like much of America’s scam economics, Modern Monetary Theory isn’t modern, has nothing to do with money (which is gold), and isn’t a coherent theory. Worse, MMT inevitably leads to hyper-inflation. But MMT is easy to understand, and its most effective proponent, Stony Brook University professor Stephanie Kelton, is an attractive, sympathetic figure. So stay tuned. Yet while governments, economists and central planners are keeping quiet about the disaster they have sown, their concern can be seen in their actions. Key global central banks—such as Russia, China and India— are buying up as much physical gold as they can, taking care not to cause panic in the markets as they do so. For its part, the secretive Basel-based Bank for International Settlements, which is known as the central bank of central banks, appears set to allow new provisions in the Basel III accord to come into force that would implicitly remonetize physical gold. Yet the general public still hasn’t caught on. Joe Sixpack and Irene iPhone are always the last to know. If history is any guide, they will get—and listen to—advice from politicians such as Bernie Sanders, Elizabeth Warren and Beto O‘Rourke, who will tell them free markets are to blame. Just a little more government spending and regulation will set things right, these politicians will argue. That means unless Americans take a hard look at the Ponzi Chart, things are going to get much worse before they get better.